New Delhi, Dec 7 (IANS) A Delhi court on Friday allowed a joint application of noted advocate Ram Jethmalani and the Bharatiya Janata Party (BJP) to withdraw a suit related to expulsion of the senior lawyer from the party. Additional District Judge Sumit Dass disposed of the suit after both sides agreed to end the suit. Jethmalani's advocate Ashish Dixit and BJP counsel Manik Dogra told the court that the senior lawyer and the party had amicably resolved the issue as BJP President Amit Shah had expressed "regret" over the senior lawyer's expulsion. Amit Shah and BJP General Secretary Bhupender Yadav called on Jethmalani and expressed "their sincere regret at the expulsion of the plaintiff", the joint application said. It said Shah and Yadav acknowledged the contribution of Jethmalani to the party. 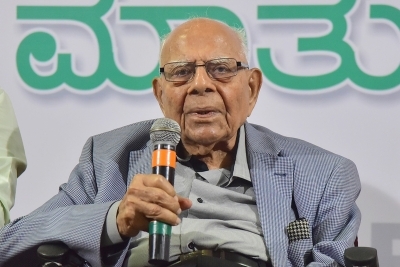 Jethmalani has challenged the party's decision to expel him in May 2013 and asked the court to declare the move null and void and sought damages of Rs 50 lakh from the BJP.